Jazz guitars are every bit as idiosyncratic and multifaceted as the genre they produce in the right hands, so trying to decide which the 'best' jazz guitar is is always going to provoke lively, probably improvised, debate. A definitive verdict is, let's face it, impossible. 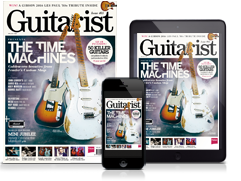 So here, we've gathered a selection of instruments that we feel offer a useful cross-section of the off-the-shelf models from a variety of jazz guitar brands. From big bodied guitars, to archtops and classic semi-hollows at a wide range of prices, these have all been vetted and approved by our eagle-eared reviews team, and should deliver years of top service, whether you play traditional, fusion or more contemporary forms of jazz. John D'Angelico is revered as the foremost archtop guitar maker of the jazz age. Based on the original Excel cutaway, the EXL-1 is a Korean-made big-bodied beauty. The neck feels pleasantly old-school with a subtly asymmetric-feeling C profile; the EX-SS's neck has a similar character. As an acoustic archtop, the EXL-1 doesn't exactly kick out a huge volume level, but it's immediately characterful with an almost clipped and very direct tonality and short-ish yet sufficient sustain. Plugged in, the EXL-1 adopts a more stately tonality. Knock back the tone and a beautiful, clear bell-like sound emerges. There isn't a huge variety of sounds, of course, but enough to go from older, darker jazz voices to more contemporary clarity. The EXL-1 recalls a real bygone age when the jazz guitarist ruled the roost, and if that's where you set your sights, it's one of the best of its type we've encountered at this price. Near the beginning of Epiphone's thinline semi-acoustic range is 'The Dot', based on the timeless and legendary Gibson ES-335. The Dot feels comfortable to hold and play, and the neck, while by no means clubby, feels substantial in your palm, probably due to the 43mm width at the nut. Its slightly flattened C-profile increases marginally in depth further up the neck, making for a suitably vintage feel. An acoustic strum issues forth a pleasing, resonant ring. We'd wager that the Dot's all-maple construction has got something to do with that, but more obviously, the hollow bouts bolster the acoustic tone, inducing wry smiles to those listening. Before plugging in, listen to Ronny Jordan, then Noel Gallagher, then BB King, then George Harrison and John Lennon. It becomes immediately apparent that this style of guitar is hugely versatile. This Dot is no exception: the pickups, while not packing the punch of USA PAFs, offer everything form smooth and moody, front-position mellowness to screeching, bridge position rawk. It's one of the best electric guitars for jazz at this price point, too. The Dot looks fine, sounds great and plays great. To our minds, that's value for money indeed. Despite it's reputation for shreddier instruments, Ibanez's first big-name signature guitarist was actually George Benson, whose GB range has enjoyed close to a 40-year lifespan. The LGB30 (LGB means Little George Benson) sports a laminated spruce top with laminate maple back and sides. The maple's flame is subtle and looks cool and classic under the Vintage Yellow Sunburst finish. The set neck is a three-piece laminate - two outer mahogany strips and one inner piece of maple. Plugged in (we used both a Fender Blues Junior and AER Compact 60), it's interesting to see how the Super 58 pickups get on. Starting with the LGB30's neck pickup, there's a rich warm tone, undoubtedly enriched by the flatwound strings. Tweaking the controls yields everything from clarity for chime-y chords or stinging single notes and a roster of jazz legends springs to mind, from Wes Montgomery and Grant Green to (of course) Benson and modern Lee Ritenour. There is no shortage of f-hole guitars on the market at sub £1k prices, but the LGB30 holds it own: it's simply a great hollowbody with classy 'expensive' looks and has plenty of potential in jazz, blues or Americana styles. A one-trick pony this is not. Ibanez has corned the grassroots jazz market. The AKJ95 shares a similar depth, scale length and pointed Florentine cutaway as its Gibson ES-175 inspiration, the body is slightly smaller; 400mm (15.75 inches) as opposed to 413mm (16.25 inches) across its rounded lower bouts. Acoustically, it's a little light and bright but plugged in, the Super 58 humbuckers, along with flatwound strings, produce a bright-edged, ultra-modern 'jazz' voice until you back off the tones. Through an acoustic amp a more velveteen smooth jazz texture emerges; when it's shown the front end of a crunchy valve amp (watch the feedback), the thickness is impressive, and ideal for more contemporary grit. A great start-up jazz box for the serious student - or a cool-toned, evocative-looking electric for the rest of us. The G6118T Players Edition features 'ML' bracing, a pinned Rocking Bar bridge, 'string-thru' Bigsby, strap locks, locking tuners and Tusq XL nut, plus those Squeezebox caps, a treble-bleed circuit, No-Load tone pots and thinner 2.25-inch body. Gretsch's own Alnico-loaded High Sensitive Filter'Trons. Beautifully made and with some lovely period-correct details mixed with more modern concessions, there's little we don't like here. Considerably lower in cost, the Players Editions are close cousins to Gretsch's recent reissue models and would be perfect for those for rockier, less 'Gretsch-style' outings - the new string-thru Bigsby alone will cure what most of us find a chore: restringing. The best high-end jazz guitar? The 5th Avenue Jazz comes complete with a Venetian cutaway and an all-laminate body; constructed wholly from wild cherry on the all-black version or, as here, with added flame maple facings. Out of the box, the action is a little on the high side but we have a very playable guitar with a typically laminate archtop-like pushy mid-range projection. Plugged in, the humbucker drops us right into that classic jazz territory with a full-bodied voice that has just the right amount of clarity to accurately reproduce complex voicings. But not too much, so that higher string runs and licks sound thick and strong, not thin and stringy. The Jazz is certainly aimed at the more experienced jazz player. Yes, that neck pitch and bridge seem on the high side but the overall lightweight and classy build, not to mention good playability, a clean fingerboard with plenty of air to the string spacing, a lively acoustic resonance and very jazz-specific plugged-in voice all tick the right boxes. A thermally engineered centre block and bracing make this 335 acoustically louder, open and with more clarity. The 'burst top and back also look more modern than vintage, while the translucent dark brown/ almost-black sides and neck-back finish add contrast that creates a classy appearance, along with the nickel hardware. We also get a lightweight aluminium stop tailpiece with locking studs, but this is all-very-classic ES-335 fare, such as the small block inlays and the small fleur head logo. Again, Gibson's build specs tell us we have MHS 'buckers and here the 'Memphis Tone Circuit' includes matched pots with a tight five per cent tolerance, with the same 'orange drop' tone caps as the ES-275. Plugged in, it's like all our Christmases have come at once. There's a more solidbody response here, as you'd expect, and it really pushes out the sound. It's expensive, but as an investment, this is one of the best electric guitars on the market. The Streamliner concept is simple: to create more affordable Gretsch guitars without losing their specific DNA. Side-by-side with an Electromatic G5420T, the Streamliner - which is nearly half the price - certainly doesn't look cheap. Aside from slightly untidy f-holes, the finish is cleanly edge-scraped, revealing a white binding, top and back, with an inner black line, while the fretwork is similarly crisp. 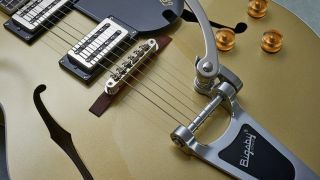 The licensed Bigsby B60 and Gretsch's anchored wood-based Adjusto-Matic tune-o-matic-style bridge are identical to the Electromatic G5420T. Strapped on, the G2420T feels huge, but its relative light weight hangs well on a strap. Compared to our reference Electromatic G5420T there's a big difference, not least in a reduced feedback threshold. There's a thicker, more generic sound, but still with some Gretsch-ness, which for many players could be just as much an advantage as not. The master volume is very useful, especially on such a big guitar with a Bigsby. Overall, the deep hollowbody G2420T is hugely evocative and perfect for lower-volume older styles. Though John Etheridge's signature the JE is essentially the same as the standard Fret-King Elise in terms of its Korean origin and solid-wood construction, this sample impresses, as it's lighter than the previous Elises we've tested. As a result, played seated, it sits on your lap rather than having the tendency to slip off due to the weight of the body and its balance point. Clean through an amp, it captures plenty of the 335's snappy percussion, but the Vari-coil control could be renamed 'colour': fully clockwise (humbucking) it nails a very PAF-like low output 'bucker tone. As you turn the control anti-clockwise, the sound thins out, and fully 'off ' (single coil, voicing the screw coils only) has bags of sparkle and bite. The neck humbucker has the right amount of plumy-ness; back the tone off a little and the clarity smoothes a little; knock the Vari-coil back and it's like a slightly underwound P-90. With crunchier tones, there's a very Robben Ford openness, but it's hard to be definitive because there are so many colours here. With its downsized, offset ES-335-meets-mini-archtop vibe, the Fret-King is a superb guitar.